March 21, 2019 Robert W.
Building dust permit signs are regulated by the Clark County Air Quality Management Board in Las Vegas. 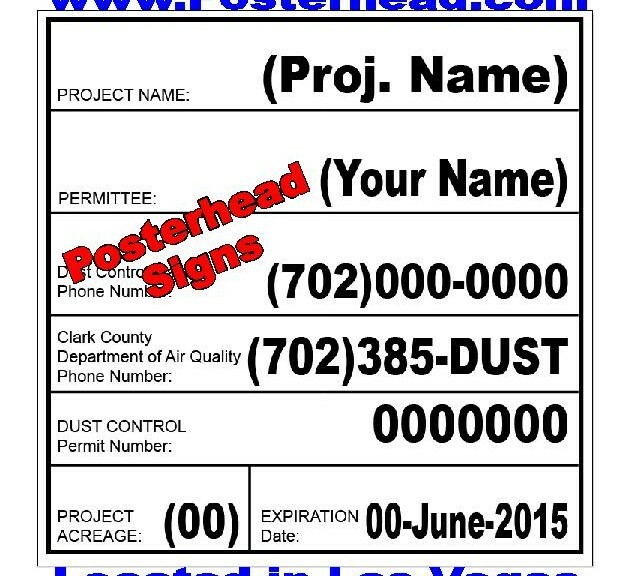 These dust permit signs allow for dirt to be moved around with the idea of protecting the air from dirt particles, which is a major source of pollution in Las Vegas. Building dust permit signs in in two different sizes, the 4ft x 4ft dust control sign and the 4ft x 8ft dust control sign. When the acreage of the construction project is below 10 acres, the 4ft x 4ft sign is required and above 10 acres, the 4 ft. x 8ft dust sign is required. Certain text and height of the test is required on the sign along with information about the job site and contact information. The sign is then placed at the jobsite in the open so that people can view it. The dust signs on printed on a vinyl application with eco solvent inks ( inks designed to last a long time in outdoor weather, especially in the hot summer sun of Southern Nevada ) and then laminated to help protect the sign. The substrate of sign is either made with an aluminum panel ( with a filler panel to add strength to the sign ) or wood. Many of the contractors like the aluminum sign because often the sign will get run over with a bulldozer or other large piece of equipment and can be straightened out and rehung. The wood signs break into pieces. Building dust permit signs are not expensive, an aluminum dust sign that is 4ft x 4ft costs under one hundred dollars and the 4ft x 8ft dust control sign is around $175.00. These signs can be ordered through your local sign store and made rather quickly, often in just a day or two. Sometimes, in emergencies, they can be made same day if you need to be incompliance.